ABOUT NEW EPISODES OF “STORAGE WARS”: On “Storage Wars,” all the buyers’ return to use their extensive knowledge and clever strategies as they bid on abandoned storage lockers at auctions throughout Southern California. Jarrod Schultz and Brandi Passante may not have the most experience in the game, but they bring enough attitude to be a match for veterans like Darrell Sheets. With nearly 40 years of hustling deals under his belt, Darrell tries to pass his knowledge onto his son Brandon while always on the lookout for another huge score. Ivy Calvin and Rene Nezhoda battle for the best units to keep their thrift stores thriving, while Dave Hester creates more competition than some can handle. Feisty Mary Padian continues to struggle through lockers to make enough profit to start her own store and auctioneers Dan and Laura Dotson show that every storage locker has a chance to be stacked and packed! 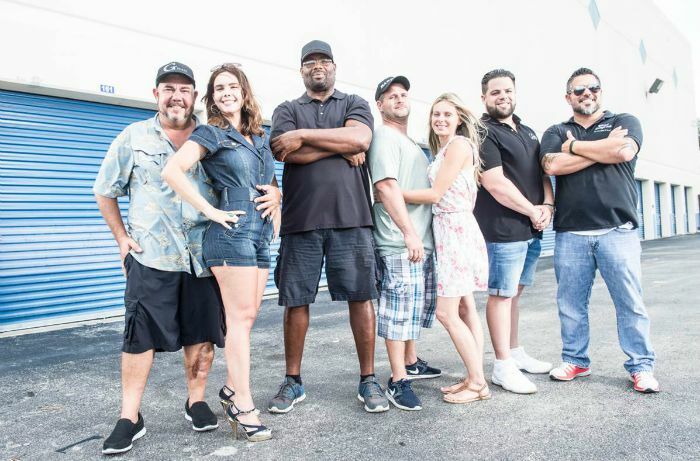 ABOUT “STORAGE WARS: MIAMI”: In “Storage Wars: Miami,” emotions run high within this feisty group of dynamic buyers who hope to find the kind of valuable and fascinating items that can make auctions run up to thousands of dollars. As they navigate the scene, these eager bidders must choose between two very different local auctioneers: Bob Nichols and Jerry Mahaffey. Long-time buyer Kevin Pew has the most experience, as well as the quickest wit. Fiery Cuban couple Jorge Gomez and Maydel Garcia are fun-loving treasure hunters. Married duo Greg and Lindsey Atz have a love/hate relationship: they love making money, but they hate working together. And cousins Yorgen Ugalde and Christian Fernandez are always trying to fill up their store, 7 Days Garage Sale (closed on Sundays). From alligators in the Everglades to beautiful people in South Beach, Miami has a little of everything…which means there’s sure to be unique treasures hidden behind locker doors.